Which app should you use to organize your photo collection? Update: We goofed up the iCloud Photo Library storage prices. The error has been fixed below. With rapidly expanding image and video collections, three things are hot on everyone’s wish list: constant and automatic backups to an offsite location, having your entire image and video library available on all your devices, and having the edits you make to an image on one device show up on your other devices. Both Apple Photos and Google Photos offer these insanely great, sanity-saving features, but how do the apps really stack up? I’ll put Apple Photos against Google Photos and discover just how similar (or different) they are when it comes to storage, importing, organizing, editing, sharing and creating projects. As you’re about to learn, Google Photos grants a couple of wishes that you didn’t know to ask for. Raw files are welcome and your images are stored in their original size at full quality. Google Photos is free, with limitations. You can enjoy unlimited storage for images up to 16 megapixels (which far exceeds what today’s iOS devices can capture), and videos up to 1080p (4K videos are supported with the Google Originals plan, discussed momentarily). Images and videos that are bigger get downsized; however, everything is optimized (compressed) into high quality versions (this algorithm is applied in the cloud, not on your devices). Raw files are stored as JPEGs on Google’s High Quality plan—that said, it’s next to impossible to spot any quality loss, especially if you’re viewing imagery on mobile devices. Storage space pricing for safeguarding your originals is nearly the same until you reach a terabyte, at which point Google’s pricing is half that of Apple’s and, as of this writing, Apple’s storage options top out at 1TB whereas Google Photos offers up to 30TB. If you’re okay with Google’s high quality plan, you don’t have to pay a cent (unless you routinely make giant prints, this is a great trade-off). 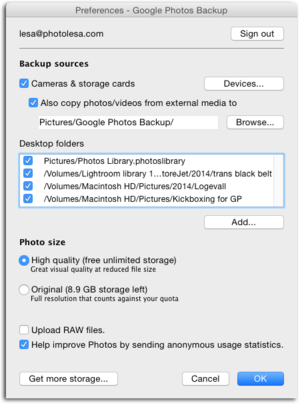 Both Apple Photos and Google Photos sport mobile and desktop methods for importing and viewing your library. With the Google Photos app on your iOS device, any picture and videos you take (or save to the device) automatically show up in Google Photos like they do in Apple Photos (via iCloud Photo Library or My Photo Stream). Importing images on your desktop works similarly in both apps—you can drag and drop pictures (or folders of them) into a web browser pointed at photos.google.com or onto the Apple Photos window or its app icon (though by default the app opens automatically whenever you connect an iOS device to your Mac). Google Photos Backup preferences lets you designate devices and folders for auto uploading. If you include your iPhoto or Photos library, anything you import into them gets uploaded to Google Photos, too (this trick doesn’t work with Adobe Lightroom catalogs). If you download the Google Auto Backup desktop app, you can designate specific devices (cameras and storage cards) and desktop folders for automatic uploading to Google Photos. Apple’s older iPhoto has a hidden folder that you can manually drop goodies into for automatic importing into the app—Control-click the iPhoto library and choose Expand Package Contents to find the auto import folder—Photos doesn’t (yet) and you can’t (yet) set up an Automator workflow to do it either. 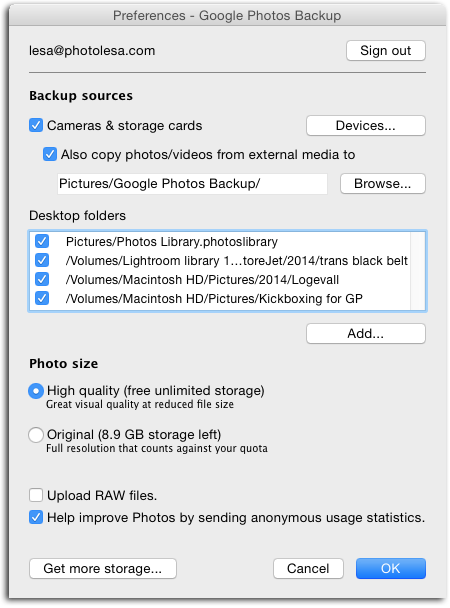 If you shoot in raw format and you want Google Photos to see edits you make in a raw processor (say, Adobe Lightroom or Camera Raw), you must export and upload the images as JPEGs (pushing your edits into the metadata in those apps won’t work). To that end, Lightroom users can easily create an export preset (called a Publish Service) for this and then specify the destination folder for automatic upload as mentioned earlier. Why would you do this? To use Google Photo’s easy web sharing and nifty Creations, which I’ll get to in a bit. The interfaces for both Apple Photos and Google Photos are wonderfully spartan, though the Google Photos interface takes some getting used to as commands are a bit hidden, but you can master it quickly. Both apps display your digital mementos in a grid-like fashion in chronological order, though the most recent appear at the top in Google Photos whereas they’re at the bottom in Apple Photos. If you’re using Apple’s iCloud Photo Library, all your digital goodies are synced between your devices and thus appear in the Photos app on those devices, though they’re also accessible (and downloadable) in a web browser. The same is true of Google Photos, but there’s no Mac app for viewing or selecting—you use a web browser. Both apps let you quickly select all the images taken on a certain date or within a certain time period, so you can add them to an album or project. You can also select images manually by clicking their thumbnails or by Shift- or Command-clicking to grab multiples. Apple Photos for Mac also lets you create folders to, say, corral several albums and projects into one container, and you can do the same thing in Google Photos using Collections. Viewing images in Apple Photos (top) and Google Photos on your desktop (middle) is similar. To open the Google Photos menu (bottom), click the icon at upper left that looks like four lines. Google Photos’ mobile app has additional viewing and selecting tricks that Apple Photos for iOS lacks. A pinch gesture zooms in or out of your collection chronologically to see Year and Moments views wherein thumbnails are summarized like they are in Photos, and a handy slider lets you quickly scroll through months (an overlay appears telling you which month you’re flying past). Tap and hold your finger atop a thumbnail to enter selection mode, and then drag up, down, or across to select multiple thumbnails at once. When you make a selection, a blue menu bar appears with a standard share icon, a plus sign that lets you create a new album, movie, story, animation, or collage, as well as add the selected thumbnails to an existing album, and a trash icon for deleting. 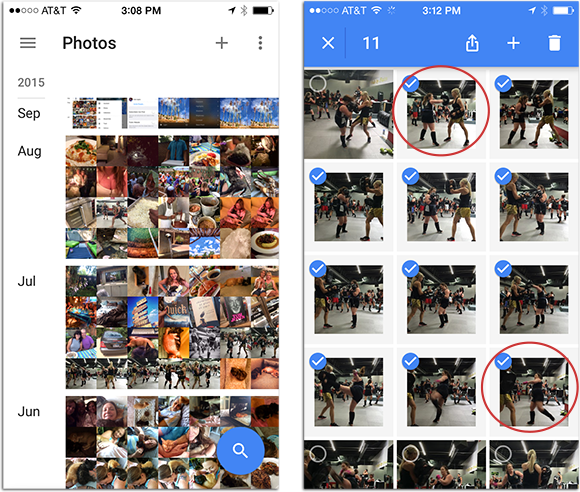 In the Google Photos mobile app, you can pinch your way in or out of Year or Moments view (left). You can also tap and then drag your finger diagonally between the two thumbnails circled here to select everything in between (right). Both Apple Photos and Google Photos analyze the content of your images in order to organize them, but Google Photos really shines in this area. Apple Photos’ automatic organization prowess extends to facial recognition and some self-populating albums (last import, videos, bursts, panoramas, etc. ), but Google Photos automatically organizes them by people as well as places and things. For example, if it recognizes a landmark—say, the Eiffel Tower or the Colosseum—it automatically assigns a location tag. As of this writing, Google Photos doesn’t let you add location data manually, though Apple Photos in OS X El Capitan does. Google Photos also organizes images according to what’s in them—food, flowers, dogs, cats, skies, forests, waterfalls, or whatever. To do this in Apple Photos, you have to create and assign keywords and then make smart albums—self populating albums based on criteria you set—to gather them. You can’t manually create smart albums in Google Photos. 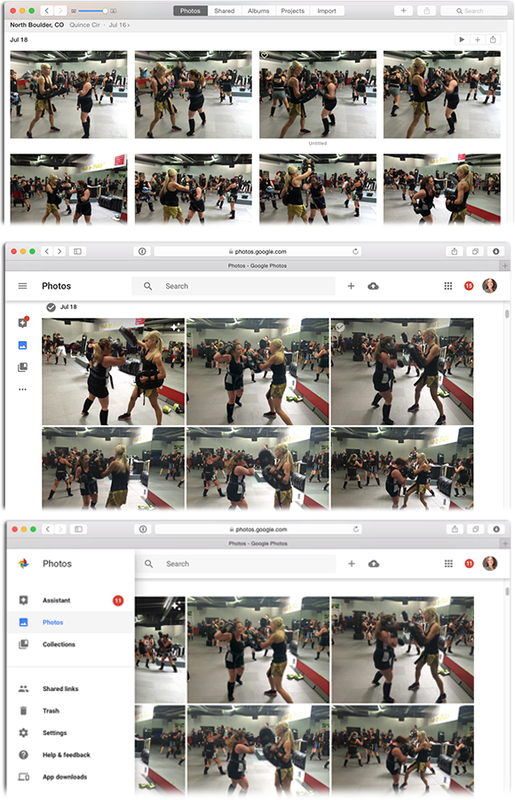 As a result of Google Photos’ automatic organization, its search feature feels more robust than Apple Photos’ when you first start using it...or at least until you force yourself to apply keywords in Apple Photos. 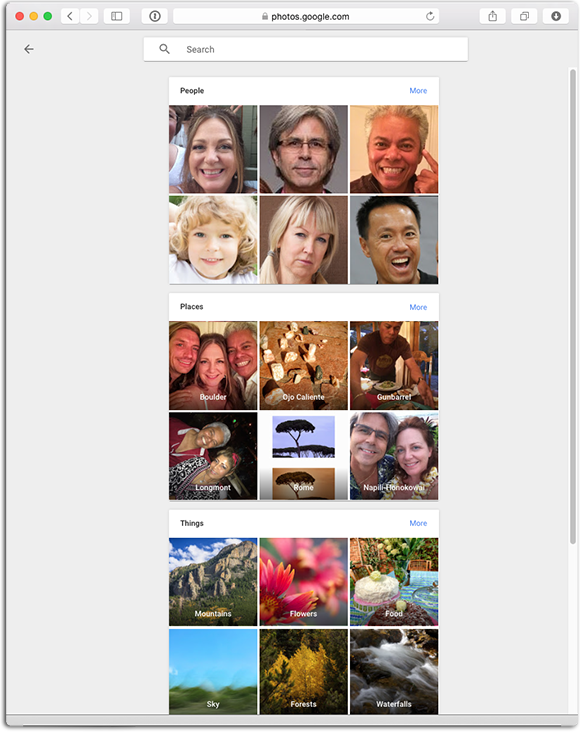 Apple Photos also lets you favorite and hide images; Google Photos doesn’t. Both apps sport an Info panel for viewing metadata and for entering a description. While Google Photos doesn’t yet let you add keywords per se, you can tuck them into the description and then use the search field to find them. Editing in both apps is non-destructive, so you can always revert to your original. Apple Photos for Mac’s editing options include Enhance (think auto-fix), Rotate, Crop (with aspect ratio control), Filters, Adjust panel, Retouch (for zapping blemishes and small objects) and Red-eye tools. In OS X El Capitan, Apple Photos for Mac lets you access third-party plug-ins for even more editing power through a feature called Extensions. The Adjust panel houses smart sliders that let you fix lighting and color without destroying your image and create beautiful black-and-white images. These three smart sliders also include powerful sub-sliders that let you fine-tune what the smart sliders are doing (for example, you can reset your image’s black point, fix a color cast, and tweak the tonal mix of a black-and-white). Dig deeper into the Adjust panel and you find seriously advanced adjustments (a la Aperture) such as white balance (you get an eyedropper, plus tint and temperature sliders), Levels (it has eight adjustable sliders in four different histograms), definition, noise reduction, vignette (strength, radius, and softness), and sharpening (intensity, edges, and falloff). Whew! However, those six advanced adjustments, as well as the Retouch tool, aren’t in Apple Photos for iOS. Apple Photos for Mac lets you copy edits made to one image and then paste them onto another, which you can’t do in Apple Photos for iOS or in Google Photos (mobile or web versions). The editing tools in Apple Photos for iOS (top) aren’t as discoverable as those in Google Photos mobile app (bottom), but they’re more robust. In Google Photos, you get the same lean-yet-useful editing tools whether you’re in a web browser on your Mac or in the mobile app. An Auto button prompts Google Photos to fix the image for you, though you can take matters into your own hands using the Light and Color sliders—they’re similar to Apple Photos’ smart sliders, but you don’t get any sub-sliders for more advanced adjustments. The Pop slider lets you boost color and add contrast to areas without destroying skin tones, and an intelligent Vignette slider produces a dark-edge vignette centered on your subject and not the center of the image like the one in Apple Photos for Mac (you can’t add vignettes at all in Apple Photos for iOS). Google Photos also has a Crop tool which lets you rotate and crop an image, though you can’t pick a specific aspect ratio like you can in Apple Photos. However, if you draw a box that’s nearly square, Google Photos snaps the crop to a square—if not, you’re in freeform crop land. Overall, Google Photos’ lean editing toolset means quicker editing, but those who crave more power can easily pass images from Google Photos to Google’s popular (and powerful) editing app, Snapseed. 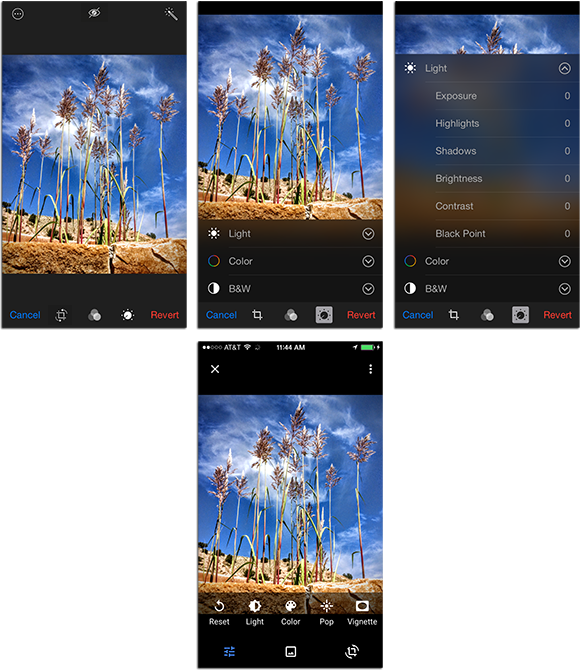 You can also apply 14 tasteful filters in Google Photos, compared with (as of this writing) eight in Apple Photos. After a few months of using both apps on my iPhone, I favored Google Photos for its editing speed and the ability to add a vignette. Sharing images in both apps via message, email, social media, and with others is easy, though as of this writing you can’t create a new Facebook album with Google Photos like you can in Apple Photos, which is a bummer. When it comes to sharing images with other people outside of social media, Google Photos does it with a web link instead of shared albums like Apple Photos (which also has an option for creating a public web gallery). This means you can’t manage subscriber invitations and privacy options in Google Photos like you can in Apple Photos. Anyone you share a Google Photos link with can add their own images which you can then easily add to your Google Photos library (if you share raw files, your buddy gets JPEGs and vice-versa). When it comes to creating image-related projects, Apple Photos excels at print stuff such as books, cards, and calendars—you can’t make any of that with Google Photos. Movies can be made in both apps by combining stills and video, and you can customize your work by picking a soundtrack and theme, though only Apple Photos lets you add captions. On the other hand, Google Photos can create stuff that Apple Photos can’t such as animations and collages, it can stitch panoramas, and combine images and videos into linear, scrollable stories complete with a little map. In fact, the Google Photos Assistant automatically assembles these goodies, called Creations, for you. If it detects five or more images in a sequence, it creates an animated GIF that you can save and export. Other Creations include collages, stories, creative image treatments (think filters and edge effects), and movies. To see suggested Creations, open the Google Photos Assistant. From there, you can discard the ones you don’t like or save, share, and download the ones you do. If you’re on the mobile app, you can also edit Creations as well as make new ones. That said, Apple’s new Live Photo feature—debuted on the iPhone 6s— automatically captures three seconds of video surrounding each shot you take. Google Photos’ animated GIFs are handy for sporting events when you meant to capture video instead of stills. The app even duplicates a few frames to give it a looping effect. It’s tough to say which app you should use, as it comes down to which company you trust more with backing up your imagery: Apple or Google. Happily, you don’t have to pick one app over the other; you can easily use both to their strengths and sit tight until they mature. Until next time, may the creative force be with you all!